KO Performance is the premier supplier for Audi parts, and Audi accessories, whether for Audi performance, Audi suspension, or Audi maintenance and OEM Audi part applications. We carry only the highest quality Audi parts, and offer the best prices on those Audi parts. If you don't see what you want, just ask! Many lines are not yet on our site. Top brands include: OEM Audi parts, Koni, Bilstein, H & R, Neuspeed, and Eibach. Tired of replacing those costly control arm end links at dealership prices? 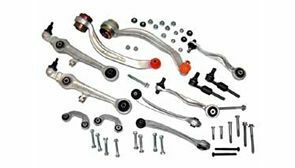 KO Performance has taken the time to piece together the complete kit with everything that is needed to replace these easily worn out OEM Audi parts.